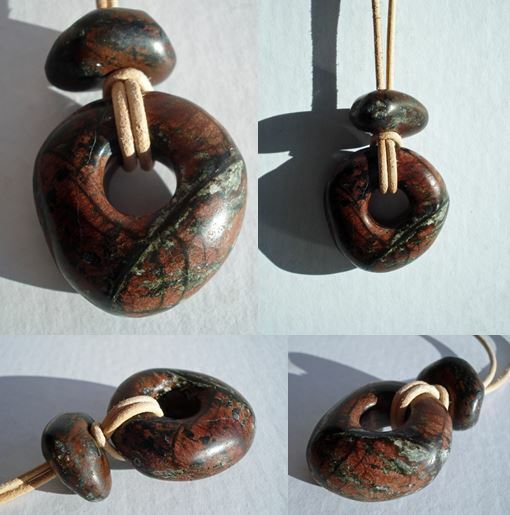 On various journeys down to the Lizard Peninsula in Cornwall, we picked up and bought a few pieces of pebble sized (and larger) serpentine. Having stored them outside my workshop for a couple of years, I finally had a chance to start working on them before Christmas 2018. I started these pendants by coring with diamond corers and shaping each piece with diamond burrs, files and wet and dry paper. 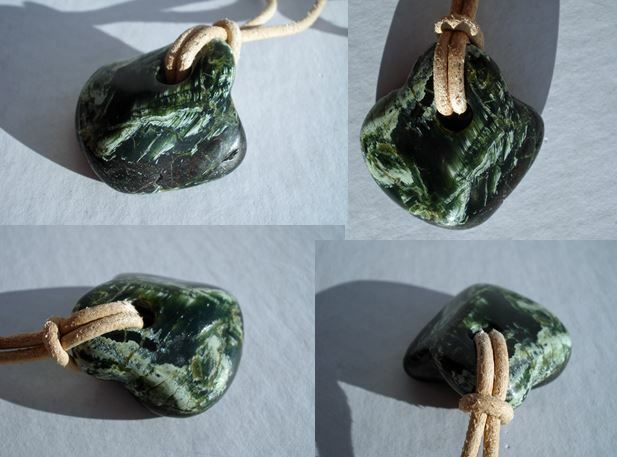 I then hand polished the surface and the cored sections of each stone with 1200 grade wet and dry paper. 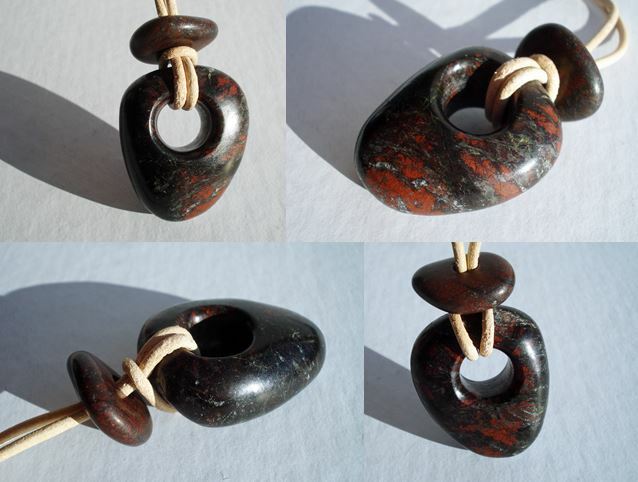 Once I had the desired rough shapes of each stone, these were placed in my stone tumbler for just over a week with an increasing fineness of polishing compound. 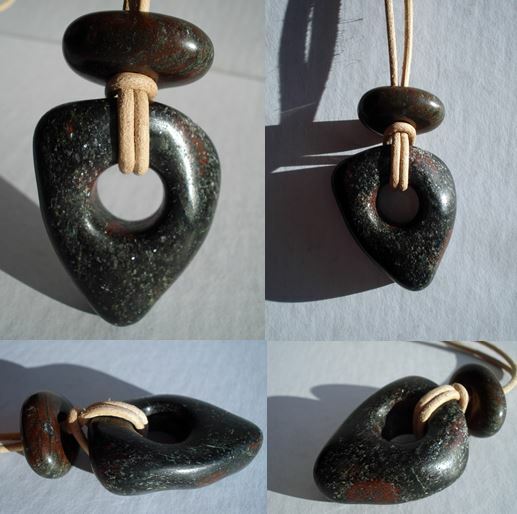 After the process of stone polishing, the serpentine was ‘burnished’ and each stone was hand polished with a lint-free cloth to give a mirror-like finish. 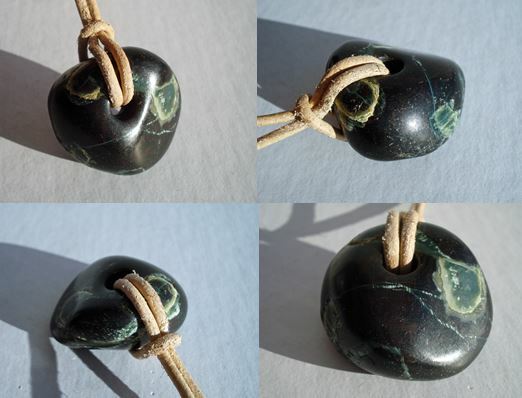 The pendants are assembled using natural 2 mm leather and tied using double slip-knots for an adjustable drop length. 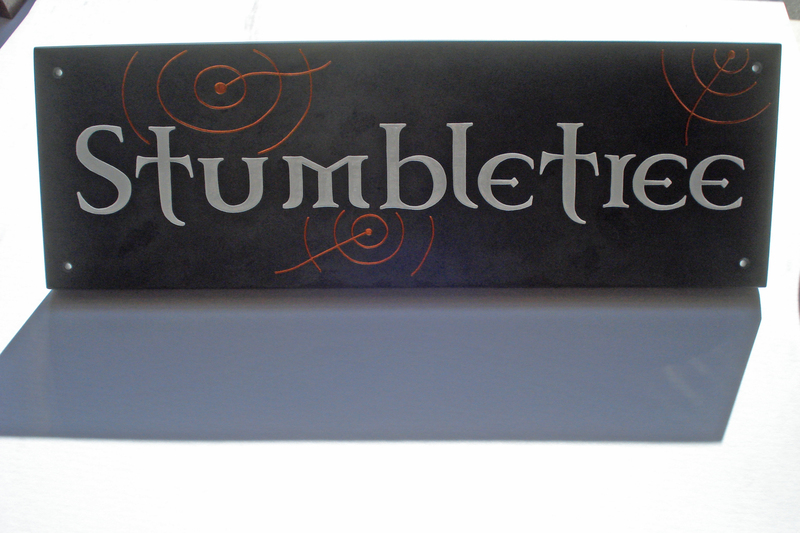 ‘Stumbletree’- probably my favourite house name I have carved to date (45 x 15 cm). 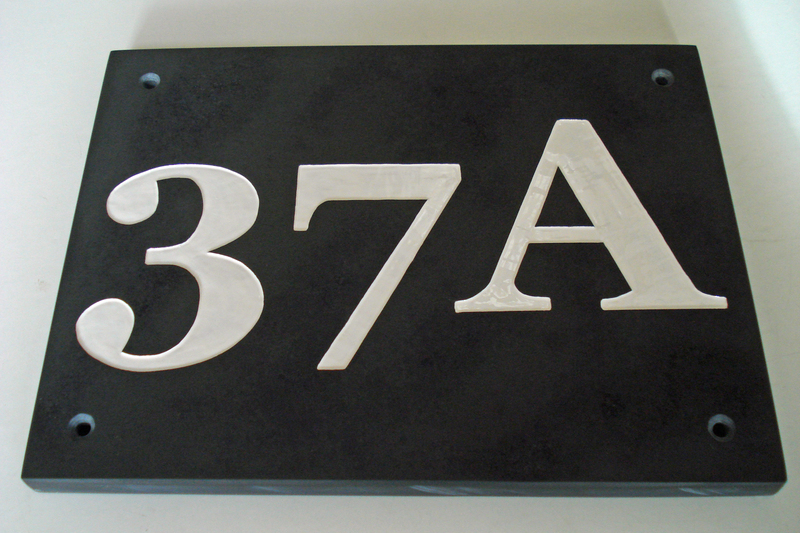 Entirely freehand carved from a 1 cm slab of slate. The customer had seen my work at Kilmartin Museum Shop and had commissioned me to make the sign with the addition of cup and ring markings based on those found in Kilmartin Glen in Argyll, Scotland. 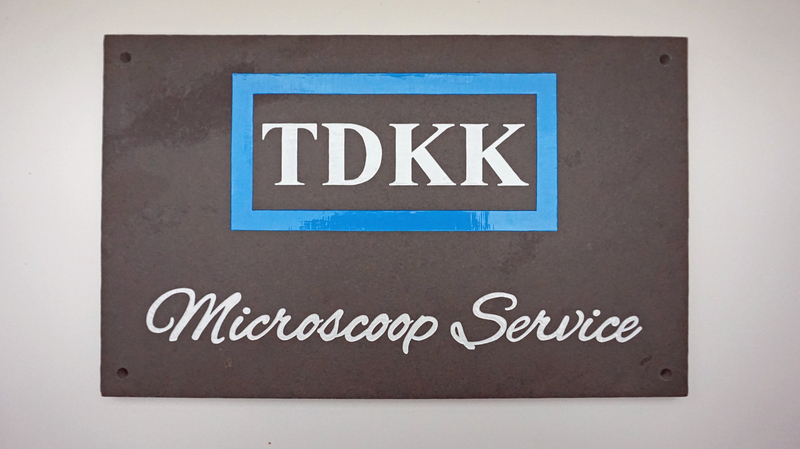 Hand enamelled using professional white and copper monument enamel. I based this design (©HatchBurnCarve) on a photograph of Josef that was supplied by the customer who commissioned this piece. 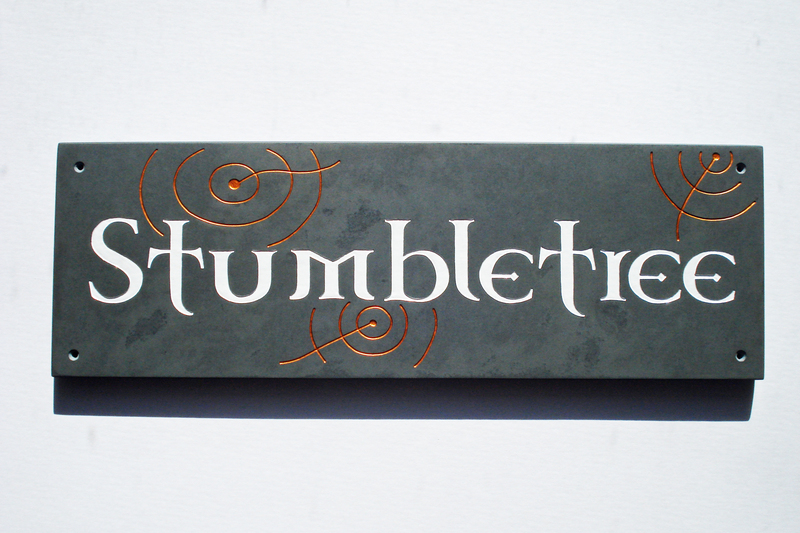 Carved from a hand cut reclaimed roof slate (30 x 25 cm), the design was freehand carved, the slate hand polished and then the design was carefully enamelled with professional gold monument enamel. 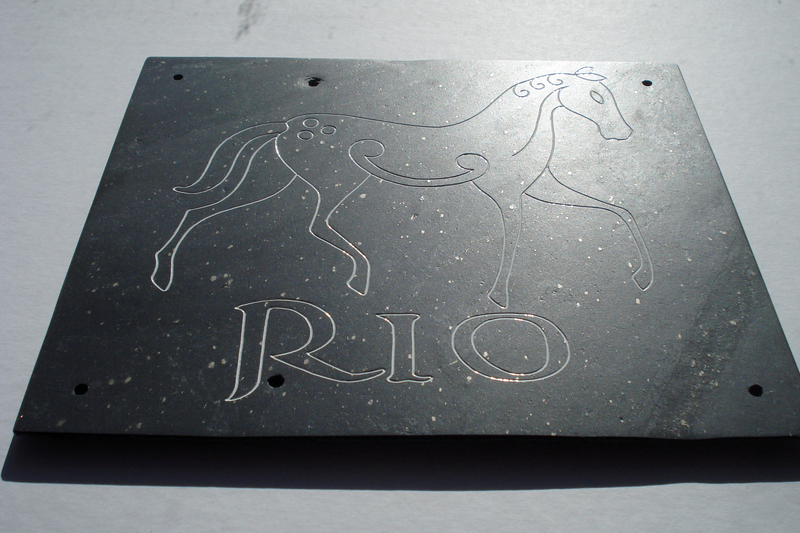 Made for a horse called ‘Rio’, this stable sign was hand crafted from a reclaimed roof slate (cut to 30 x 25 cm). 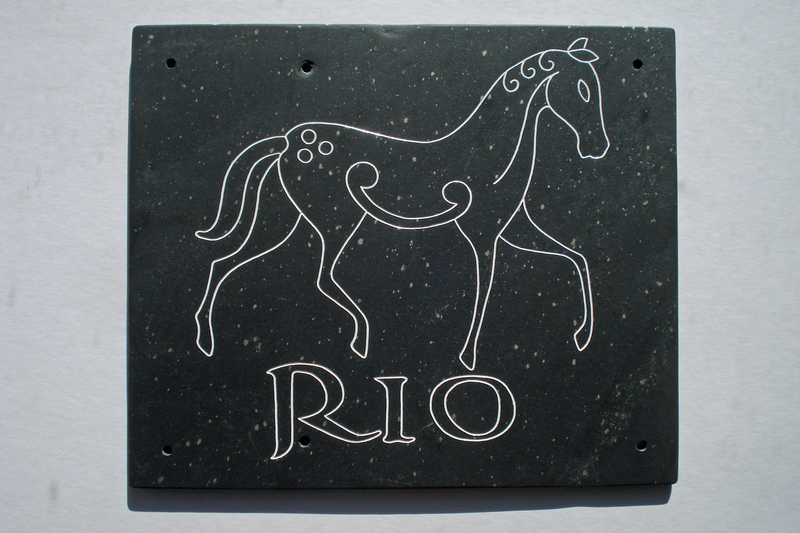 I based this design (©HatchBurnCarve) on the Pictish horse carving from the Class I Pictish symbol stone in Inverurie, taking into account the slenderness of Rio. 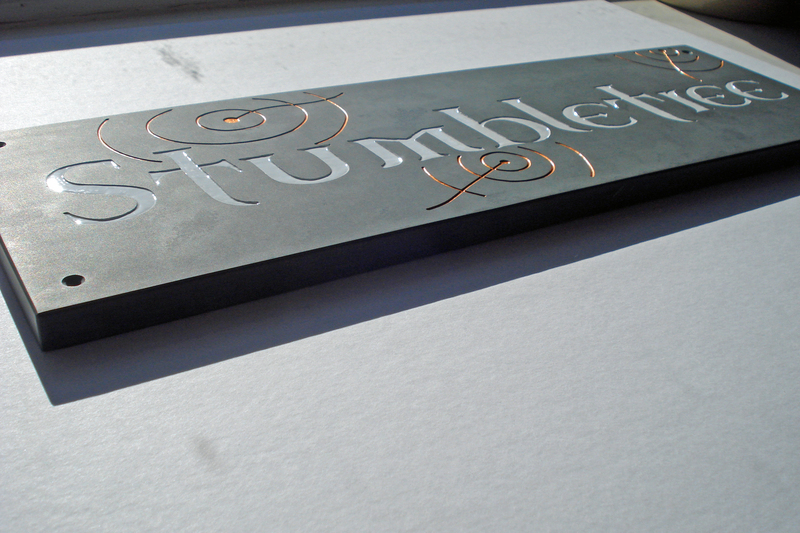 Hand carved from a reclaimed roof slate (which I cut to size, 30 x 25 cm). 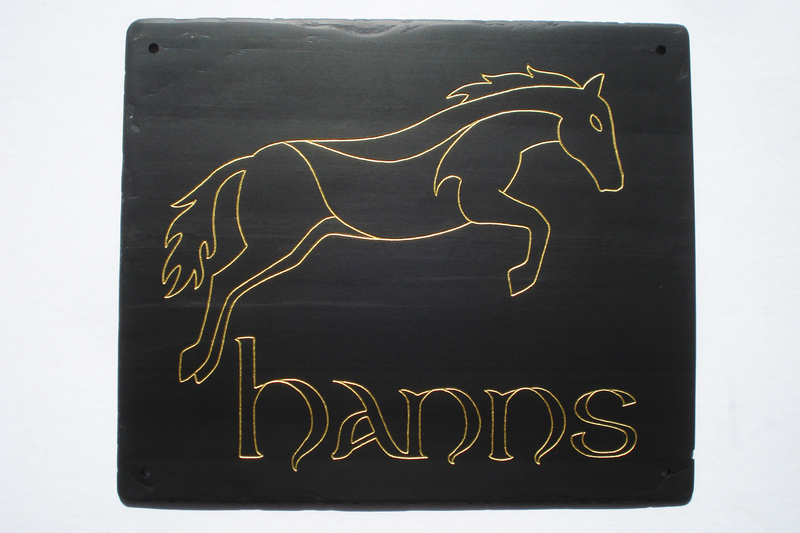 I based the design (©HatchBurnCarve) on a photograph of Hanns that was provided by the customer. 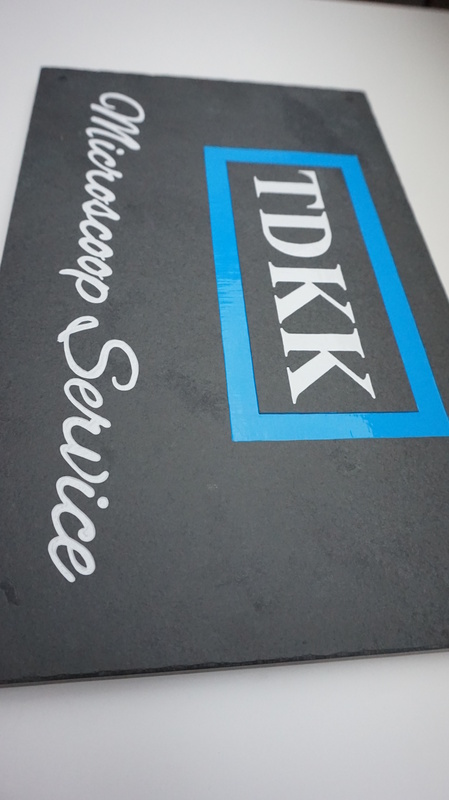 After carving, this sign was hand polished to 1200 grade and carefully hand enamelled with professional gold monument enamel. 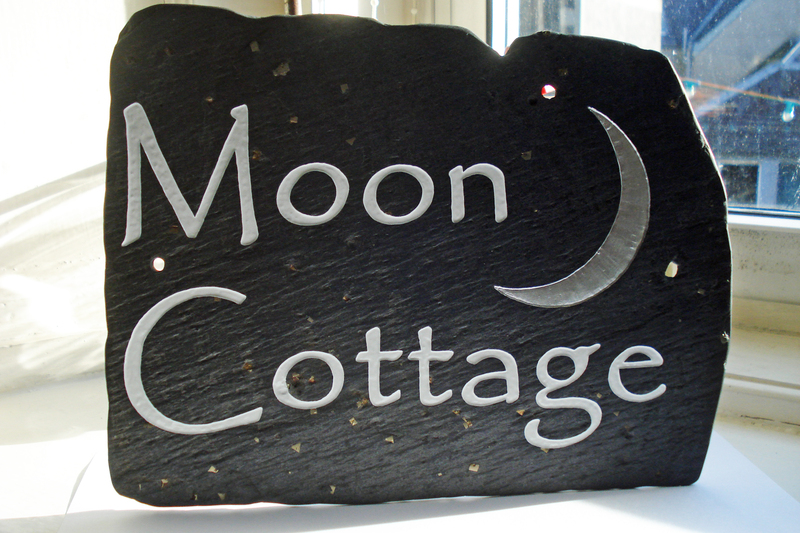 Hand carved from a slate which came from the roof of the customers parents house. Enamelled with three coats of white and silver professional monument enamel. 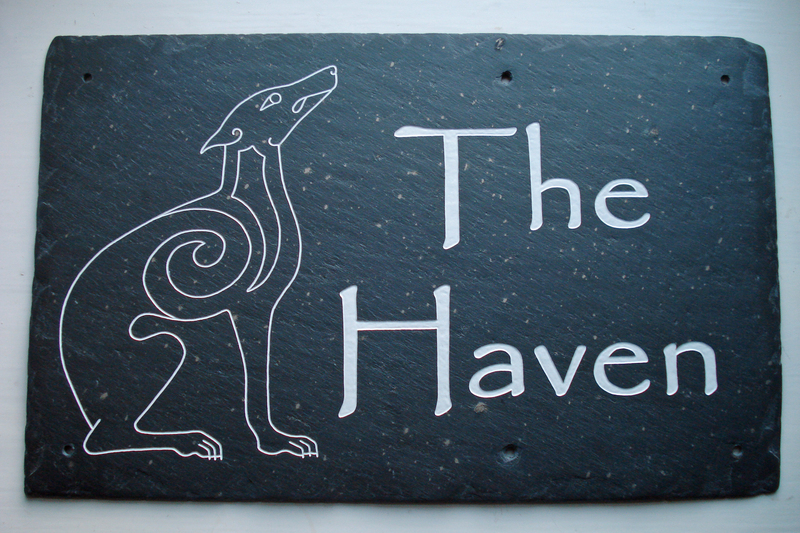 A Pictish hound house sign (design © HatchBurnCarve). 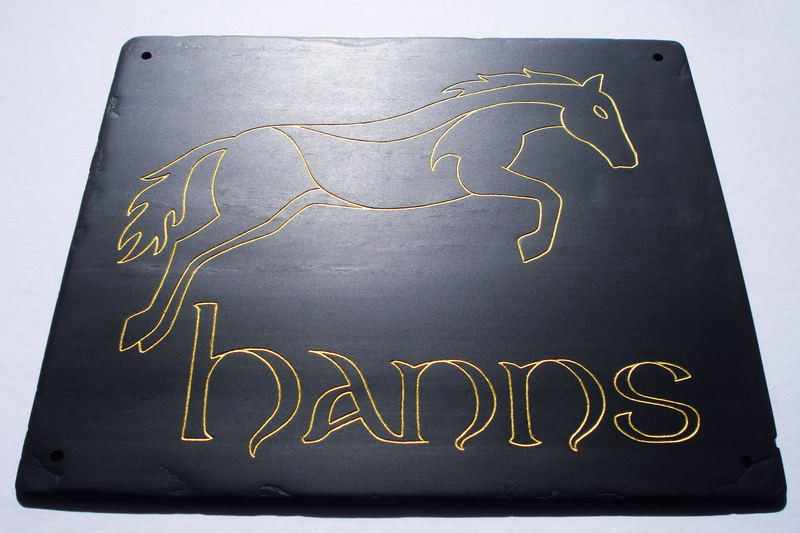 Freehand carved from a reclaimed roofing slate (approximately 40 x 25 cm). 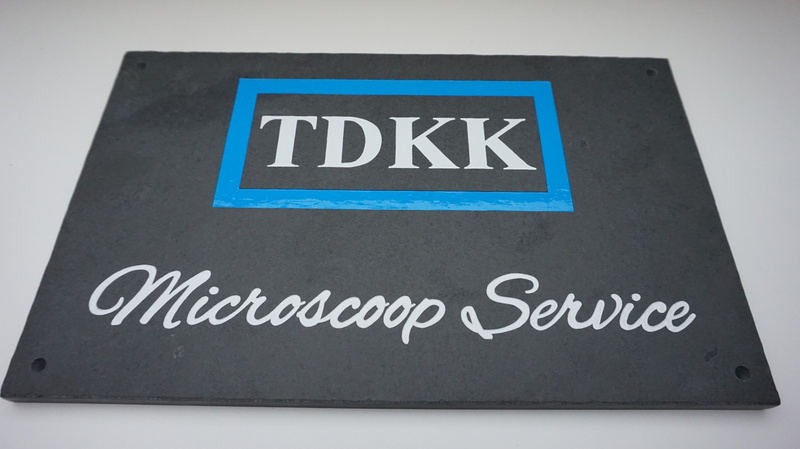 A freehand carved slate sign that I made for a microscope company (TDKK) based in the Netherlands (39 x 24 cm). Hand cut from a 1 cm slab of slate, carved, hand polished and enamelled with three coats of white and blue professional monument enamel. 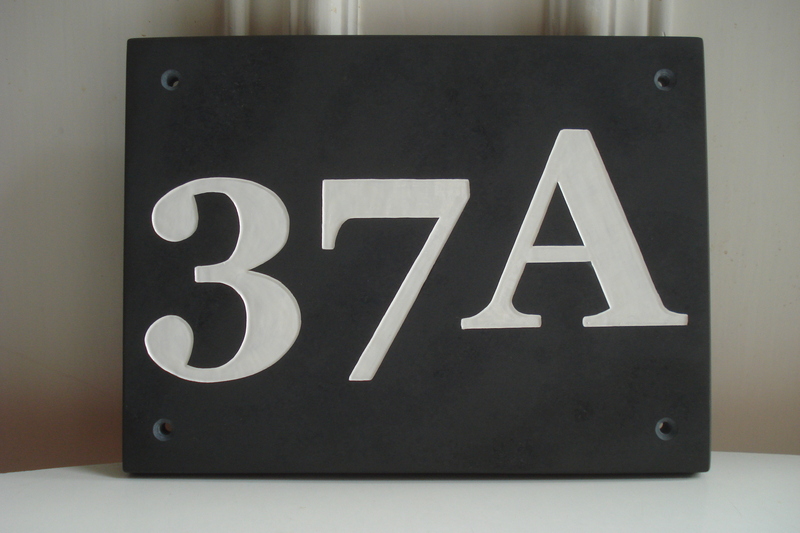 A small house number (20 x 15 cm) that I made in 2017. 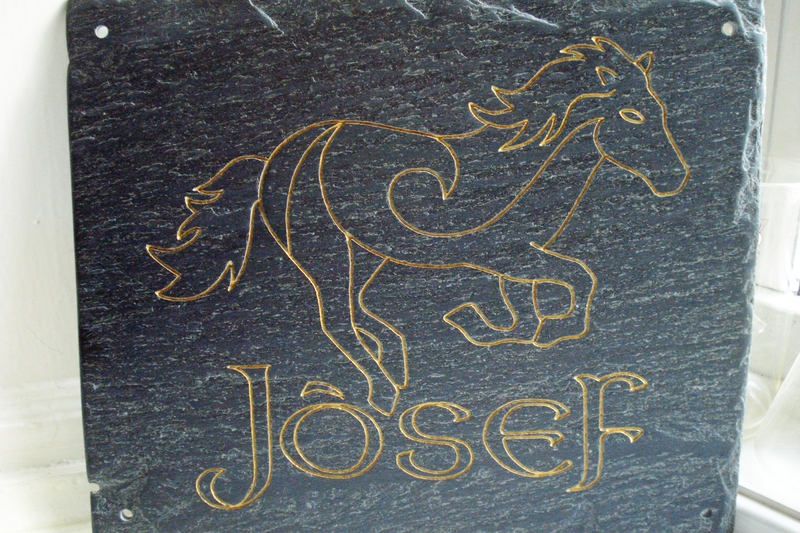 Freehand carved from a 1 cm thick slate slab, then hand enamelled with three coats of professional monument enamel. 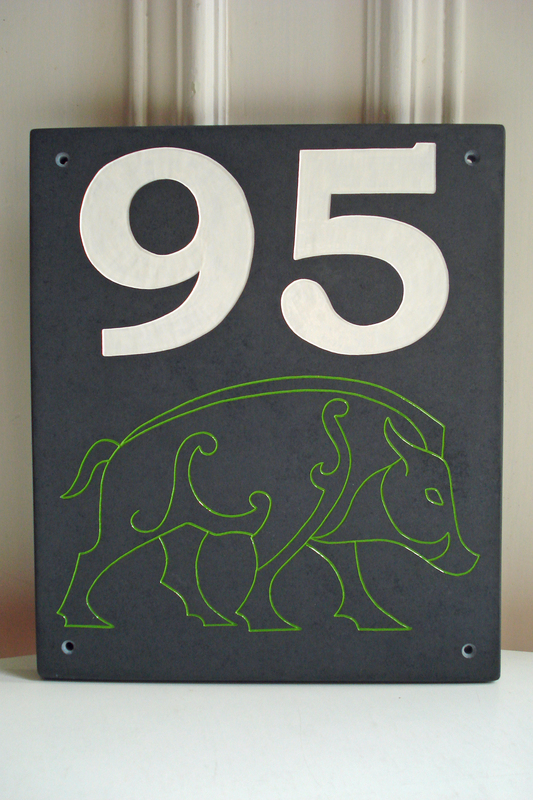 Another house sign from 2017 with a Pictish boar. 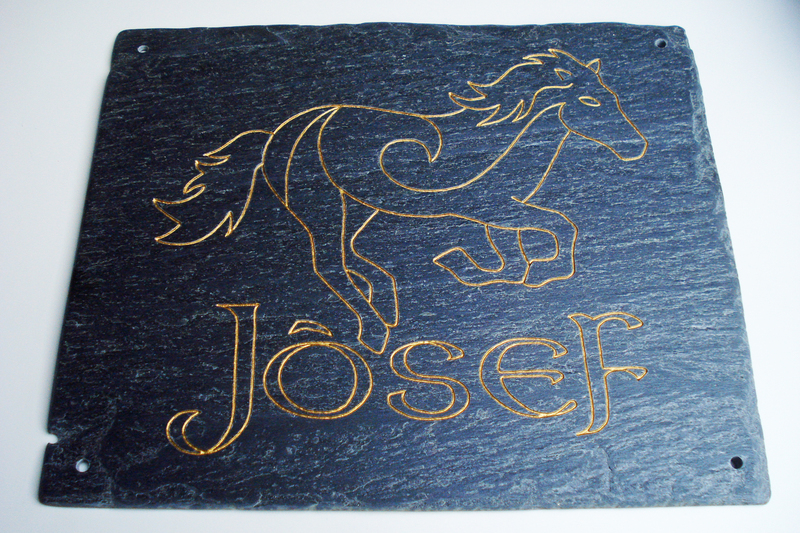 Freehand carved from a 1 cm slate slab. Measures 27 x 23 cm.